All these teenage party games are tried and tested. Guaranteed to make your party go with a swing. 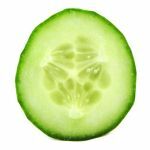 Cucumber Face can be undertaken individually or as a race between a number of players. Sit your guest down in a chair and ask them to tilt their head back slightly. Place a slice of cucumber on their forehead. They then have to get the cucumber in their mouth without using their hands. Everyone else gathers round to watch and laugh. They will go through all sorts of weird facial contortions as they move the cucumber slowly down their face over their eyes and then down the cheek. Eventually when it is close enough to the mouth they can begin to use their tongue. And at last there it is in the mouth. First person to crunch their cucumber wins. Appoint a Master Of Ceremonies who pairs off all the couples. Then give each couple a long stick of uncooked spaghetti. The first pair go to the middle of the room, face each other and put the opposite ends of the spaghetti in their mouths. The music starts preferably an ice skating classic such as Ravel's Bolero; but more funky numbers can also be quite good fun too! The couple now have to do a graceful ice ballet with as much enthusiasm and elegance as possible. No standing in one spot and just jigging from leg to leg. If the spaghetti should break during their performance they have to continue but using the longer of the 2 broken halves. This may soon lead to some very close dancing! Points are awarded by your friends for elegance, poise, technique and closeness. This is a great game if there is a particular boy or girl you have your eye on! But, there is also something very funny about watching 2 girls or 2 lads locked in an elegant embrace with only a bit of spaghetti between them! Divide up your guests into 2 teams and line them up. Tie a key to each ball of string and hand it to the first person in each line. At the word "GO" they have to drop the key down through their shirt, jumper or top then on down through their trouser leg or skirt. They then pass the key on to the next person pulling the string through so there is enough slack for their team-mate to also thread the key through their clothing but this time starting at the bottom and working up to the top (bet you wish you hadn't worn those tight jeans now!). The string is carefully threaded through after so that the 2 people are effectively strung together. The key is then passed to the next person and so on down the line, either starting at the top of someone's clothing or the bottom. It is important that all team members continue to feed the string through their own clothing. By the time the key reaches the end of the line everyone will effectively be tied together. You can either stop there or work the key back up the line again in the opposite direction. The winner is the first team to show their key at the end. A variation if you don't mind snuggling up is to pull the string as taut as possible meaning everyone has to stand very close. The string is then cut at the ball end and pulled through and out of all the clothes. Compare the length of the 2 strings to see who are "The Distant Strangers" and who are "The Snugglebunnies"! Two contestants squat down on their haunches, facing each other at about arm's length. They take hold of the sock between them. The object is to make your opponent lose balance and topple over. You can do this by straight forward pulling but also by craftily letting the sock go slack as they pull sending them backwards. Sideways tugs and jerks can also be winning moves. During the contest neither contestant can touch the ground with anything other than the soles of their feet, or let go of the sock. For extra fun organise 2 teams, members of whom will compete in turn while everyone cheers on their team-mates. Alternatively do a knock out competition leading up to a grand finale between the 2 best Sumo's. some baggy old men's shirts. People partner up and one puts the shirt on. The couple then hold hands. They then have to transfer the shirt over the head of one and on to the other. Without breaking hands. You will probably need a helper. The shirt will now be inside out but on the other person. You can compete against other couples or divide into teams. Each time the shirt is safely on a person they grab the hands of the next person in their team and start again, the shirt making its way along the line. 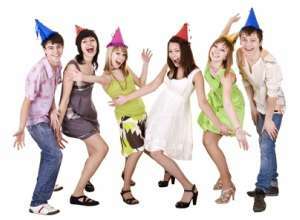 Do you know any great teenage party games?